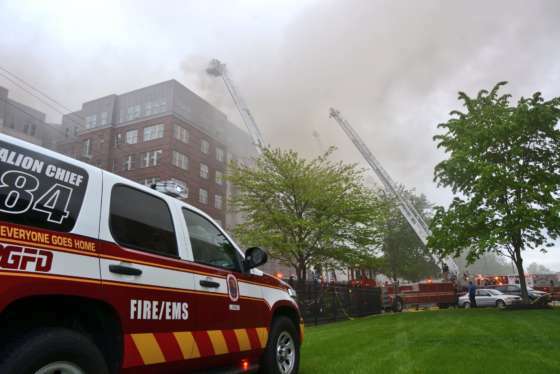 Massive plumes of smoke billowed over College Park Monday from a five-alarm fire at an apartment complex under construction near the University of Maryland campus. The fire took more than five hours to get under control. U.S. 1 was closed until the evening. WASHINGTON — A five-alarm fire at an apartment complex under construction in College Park on Monday took more than five hours to bring under control, requiring what the fire chief called the biggest response in Prince George’s County in more than a decade. The fight against the fire at the Fuse 47 apartment building, at 4700 Berwyn House Road, closed part of U.S. 1 and the nearby University of Maryland campus Monday. 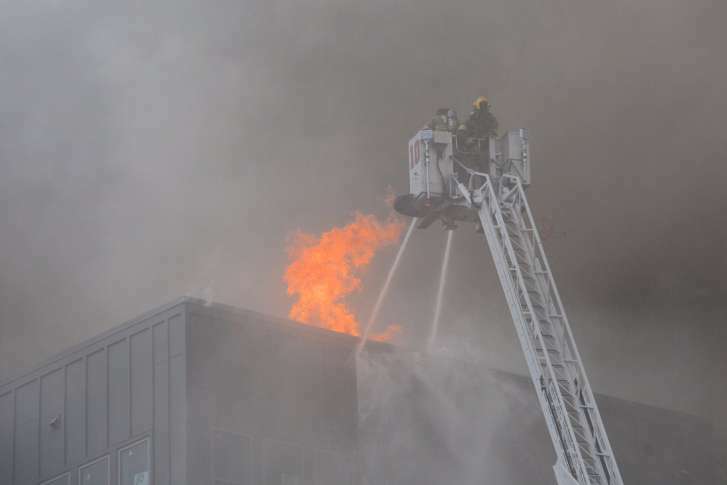 A huge five-alarm fire that drew hundreds of firefighters to a construction site in College Park Monday, April 24, prompted the largest fire response in the history of Prince George’s County. See photos. The fire was reported at about 9:30 a.m., Prince George’s County Fire Chief Benjamin Barksdale said Monday afternoon. It was under control, with some hot spots remaining, shortly before 3 p.m., Fire Department spokesman Mark Brady said via Twitter. It was “still burning pretty good” in spots, Barksdale said, at 4 p.m.
Part of the roof collapsed at the planned mixed-use residential and commercial building, located just across U.S. 1 from the university campus. The University of Maryland College Park campus closed at 1 p.m. due to the heavy smoke that billowed across Fraternity Row. People sensitive to smoke, such as those with asthma, were advised to stay indoors, shut windows and turn off HVAC units. “We’re doing the best we can. [But] with today’s weather, the smoke is laying low,” Brady said. The fact that the building was under construction meant it was unoccupied, Brady said, but a lot of timber was still exposed and normal fire safeguards weren’t in place. The fire appeared to have begun on the fifth floor of the six-story building and spread to the roof, officials said . Montgomery County Fire and Rescue assisted the Prince George’s department with the fire; Barksdale said that more than 200 firefighters were on the scene. He called it the largest fire call, in terms of manpower, in county history, other than perhaps the fire at the Upper Marlboro courthouse in 2004. Barksdale added that the nearby Spellman House senior apartment complex had been evacuated. He said that residents could probably go back at about 7 p.m.
Two firefighters were treated for minor injuries. WTOP’s Dave Dildine, Mike Murillo, Hanna Choi, Teta Alim and Anna Isaacs contributed to this report.